As a seabird colony, Skomer sees a huge influx of birds in the summer, with the vast majority of the seabirds only hoping to raise one chick in the year, if everything goes well. As if puffins weren’t charismatic enough, their chicks have the adorable name ‘Pufflings’. Those lucky enough to be in the right place at the right time have had glimpses of these young birds coming to the entrance of their burrows to stretch their wings and build up flight muscles, before retreating below ground to await more deliveries of fish from their parents. The rest of the pufflings journey however is a lot harder to follow, with the pufflings only finally leaving the burrow and fledging out to sea after complete darkness. If they survive their first winter, they will return next summer, after the breeding adults have already got eggs or chicks down their burrows and watch what’s going on. This social return is thought to be why Puffins are often slow to colonise new areas. If you get a good enough look at them, or have a decent quality photo you can tell these youngsters by their slightly darker bills with fewer grooves. If you look closely, you can see the bird in the left photo has few if any groves on its bill, compared to the bird in the right photo, which is a breeding adult. 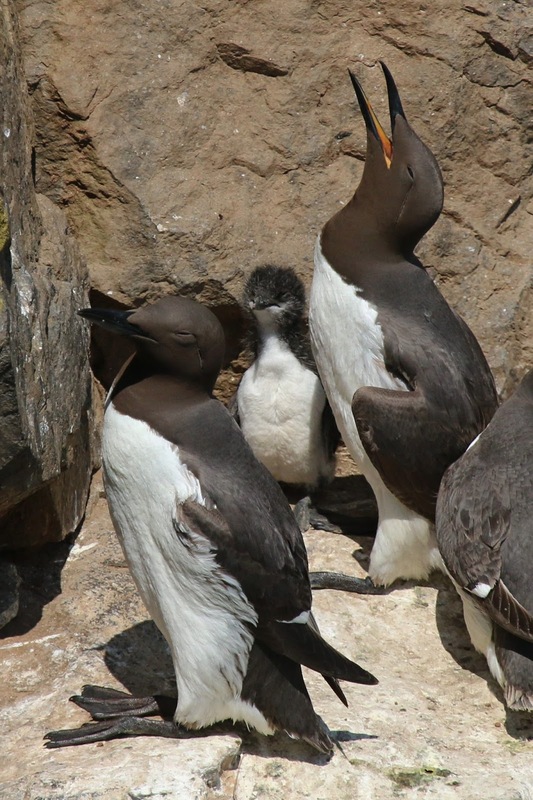 The first guillemot chicks hatched on the second of June and the first Razorbill on the 28th May. 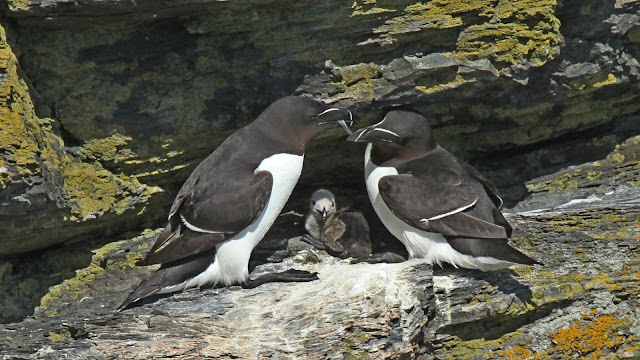 For both of these Auk species, chicks stay on the cliffs protected by an adult until when they only a third grown (sometimes as young as 15 days old), head out to sea. One of the adults (normally the male) goes down to the water and calls the chick, which calls back with a characteristic high pitched call, and eventually, during the evening it jumps off the cliff. This is where they get their name from. They do this before they are big enough to fly, and their wings can only slightly break their fall. If they survive the jump and make it to the water, they then have to make it to their parents before a gull makes it to them. 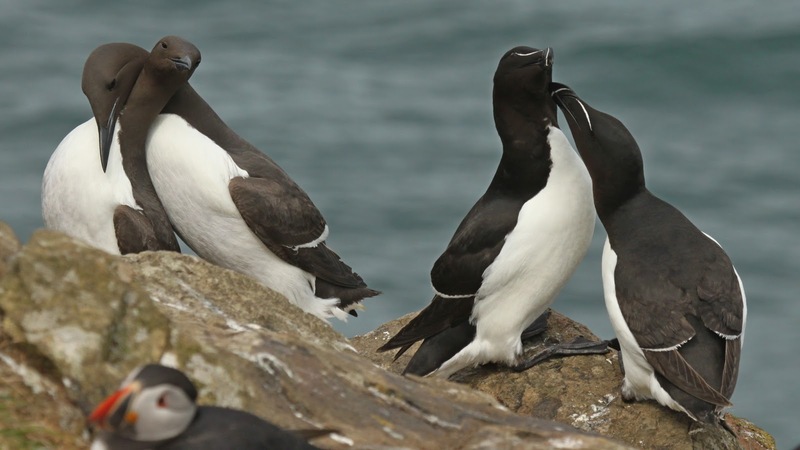 Once safe from the immediate danger, the male will take them out to sea, where they will continue to feed it away from the dangers of life on the cliffs. Similarly to Puffins, young birds return to the island when they are a few years old, but they generally don’t begin breeding until they are five to seven years old. Thanks to long term ringing studies like the one run by Tim Birkhead of Sheffield University, we are able to know in amazing detail the life history of some of our birds. For more information click here. All being well the majority of our chicks will return to the island in a couple or three years’ time, and start breeding themselves a few years after that.